The AFC-NFC Pro Bowl on February 7, 1993 was played before 50,007 fans at Aloha Stadium on a sunny day with intermittent clouds. It marked the 14th consecutive year that the game was played in Honolulu. Coaches were Don Shula of the Dolphins for the AFC and San Francisco’s George Seifert for the NFC. The NFC took the opening kickoff and drove 65 yards in 14 plays. QB Steve Young of the 49ers scrambled for eight yards in a third-and-three situation and completed five passes, the longest to his San Francisco teammate, TE Brent Jones, for 17 yards. The advance finally stalled at the AFC 10 and Morten Andersen of the Saints kicked a 27-yard field goal. The AFC punted following their first series but got the ball back four plays later when a Young pass was intercepted by Denver FS Steve Atwater at the AFC 29. Miami QB Dan Marino completed consecutive throws to WR Anthony Miller of the Chargers for 16 yards and Houston WR Haywood Jeffires for 11 to get the ball into NFC territory, but a holding penalty moved them back, and on third down Marino was sacked by Minnesota DE Chris Doleman for a 15-yard loss, resulting in a punt. The AFC managed to get on the scoreboard when, on the first play of the second quarter, LB Junior Seau of the Chargers intercepted a Young pass and returned it 31 yards for a touchdown. Kansas City’s Nick Lowery added the extra point to give the AFC a 7-3 lead. The NFC responded with a 10-play, 58-yard possession. An illegal blitz (an infraction specific to the Pro Bowl) on the AFC converted a third down and Dallas RB Emmitt Smith broke away for a 23-yard gain to the AFC 34. The NFC converted another third down before the drive came to an end at the AFC 20 and Andersen kicked a 37-yard field goal to narrow the score to 7-6. QB Troy Aikman of the champion Cowboys (pictured at right) was behind center for the next NFC series and came out throwing, hitting on three straight passes to pick up 25 yards, two of them to his Dallas teammate, WR Michael Irvin. 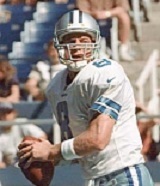 The nine-play drive covered 54 yards and ended with Aikman passing to Irvin once more for a nine-yard TD. Andersen converted and the NFC took a 13-7 lead. The AFC went three-and-out and punted, and with 56 seconds remaining in the first half, Aikman again went to the air, connecting with Atlanta WR Andre Rison for 18 yards, RB Barry Sanders of the Lions for 19, and Rison again for 11 yards. But Aikman’s next two passes fell incomplete, with a Sanders run for no gain in between, and Andersen’s field goal try was blocked by DE Leslie O’Neal of the Chargers and returned by Miami LB Bryan Cox to the NFC 35. Houston QB Warren Moon completed a pass to Jeffires and it appeared that time had run out in the half before the receiver got out of bounds. Players began to head to the locker room and technicians started to pull sets for the halftime show onto the field. But the officials ruled that there were still two seconds remaining and the field was cleared. On the final play of the half, Lowery booted a 42-yard field goal and the NFC margin was narrowed to 13-10 at halftime. The AFC started the third quarter off with a short series and punted. On the NFC’s third play, Aikman threw to Dallas TE Jay Novacek for 26 yards, but after Sanders ran twice to gain another 14 yards, Aikman’s next pass was picked off by SS Henry Jones of the Bills, who returned it 32 yards to the NFC 42. With Pittsburgh RB Barry Foster (pictured at top) running effectively and his teammate with the Steelers, QB Neil O’Donnell, completing a pass, the AFC reached the 11 before settling for a 29-yard Lowery field goal to tie the score at 13-13. Atlanta CB Deion Sanders returned the ensuing kickoff 46 yards and the NFC started with good field position near midfield. QB Brett Favre of the Packers was in the game and misfired on his first three passes before connecting with San Francisco WR Jerry Rice for 48 yards to the AFC two. RB Ricky Watters of the 49ers lost two yards on first down and, while Rice picked up three yards on a short toss from Favre, the AFC defense held as Favre was stuffed for no gain on a quarterback sneak and, on fourth down, Watters dove for the end zone and came up short. The AFC had possession as the game headed into the fourth quarter. O’Donnell completed passes to Houston WR Ernest Givins for six yards and WR Andre Reed of the Bills for nine, but the AFC had to punt. RB Johnny Bailey of the Cardinals returned the kick but fumbled when hit by Buffalo WR Steve Tasker, the AFC’s special teams representative, and punter Rohn Stark of the Colts recovered at the AFC 39. However, on the next play O’Donnell’s pass was intercepted by Phoenix SS Tim McDonald. The NFC punted for the first (and only) time following a short series and a 20-yard return by Indianapolis WR Clarence Verdin had another 15 yards tacked on for unnecessary roughness. Starting at the NFC 37, the AFC netted a yard in three plays and Lowery missed a 54-yard field goal attempt. Favre threw to WR Fred Barnett of the Eagles for 16 yards on first down and the NFC maintained possession when an apparent interception was nullified by a pass interference penalty. Favre was sacked by DE Howie Long of the Raiders on third down and that set up another big play for the AFC on special teams. A field goal try by Andersen was blocked by Tasker and CB Terry McDaniel of the Raiders recovered and ran 28 yards for a touchdown. Lowery converted and the AFC was back in front by 20-13 with eight minutes left in regulation. Young was back at quarterback for the NFC and he threw to Irvin for 19 yards and ran for eight. Sanders ran for six yards and it was Young to Irvin again for 12 to the AFC 35, but a holding penalty backed the NFC up and the next two passes were incomplete before Young was intercepted by Buffalo CB Nate Odomes. The AFC punted following the next series and the NFC took over at its 22 with less than three minutes remaining on the clock. Young threw to Rice for 16 yards but was sacked by DE Neil Smith of the Chiefs for a loss of eight. Two plays later, he passed to Brent Jones for 16 yards and a first down and, after another sack, connected with Rison for 18. Throws to Novacek and Rison got the ball to the AFC 20, but the next two passes were incomplete and Young was sacked by Cox on third down. Facing fourth down and with time running out, a scrambling Young completed a throw to RB Rodney Hampton of the Giants at the goal line for a 23-yard touchdown with ten seconds remaining in regulation. Andersen tied the score at 20-20 with the point after and, with the score tied at 20-20 at the end of four quarters, the game went into overtime. The NFC won the toss and had the first possession in overtime, but Young fumbled when caught from behind by Kansas City LB Derrick Thomas while scrambling and Long recovered for the AFC at the NFC 28. Foster ran the ball four times to reach the NFC 16 before Lowery came on to kick the game-winning 33-yard field goal at 4:09 into OT. The AFC won the first overtime Pro Bowl game by a final score of 23-20. The NFC far outgained the AFC (472 yards to 114) and also had big margins in first downs (30 to 9) and offensive plays (90 to 50). However, the NFC turned the ball over six times, to one suffered by the AFC, and the AFC had both an interception and blocked field goal returned for touchdowns. Dan Marino completed just three of nine passes for 31 yards and Neil O’Donnell had the most completed passes for the AFC, with four, out of seven attempts for 23 yards with one intercepted. Barry Foster rushed for 57 yards on 15 carries to lead the team by far (runner-up was RB Harold Green of the Bengals with nine yards on four attempts). Haywood Jeffires led the receivers with three catches for 26 yards and Anthony Miller contributed 23 yards on his two receptions. 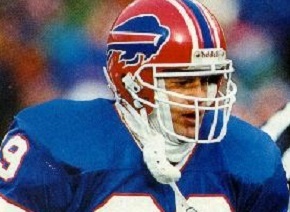 Steve Tasker (pictured below) was named the game’s MVP as he accounted for four tackles, a forced fumble, and a blocked kick. 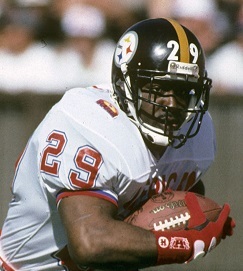 Regularly recognized for his outstanding play on special teams, Tasker was appearing in his fourth of an eventual seven Pro Bowls. For the NFC, Steve Young was successful on 18 of 32 throws for 196 yards and a TD, but gave up three interceptions and had the disastrous fumble in overtime. He also led the team in rushing with 34 yards on six carries. Troy Aikman was 10-of-15 for 120 yards with a touchdown and an interception and Brett Favre, making his first Pro Bowl appearance, completed four of eight passes for 74 yards with no TDs or pickoffs. Andre Rison had 8 catches for 80 yards and Jerry Rice gained 78 yards on his four receptions while Michael Irvin scored a TD among his 5 catches for 59 yards. The game marked the first time that the Pro Bowl went into overtime and reduced the NFC’s lead in the series to 13-10 since going to the AFC vs. NFC format following the 1970 AFL/NFL merger.